Glass is the final movie in a trilogy including Unbreakable and Split. Unbreakable is a 2000 superhero thriller written, produced and directed by M. Night Shyamalan. David Dunn (Bruce Willis) is the only survivor in a train crash that we later find out was caused by Elijah Price – Mr. Glass – (Samuel L. Jackson) who is a genius-comic book fanatic with a disease commonly known as brittle bones. Dunn came out of the train wreck unscarred and starts to question why when he notices he never falls ill or gets injured. This eventually leads to his discovering Glass’ plot and to both of their imprisonments. We eventually find out he escapes prison after seeing him at the ending cutscene of Split. Split serves to introduce Kendall Wendell Crumb, who developed Dissociative Identity Disorder (DID) after his father left to meet a doctor about his wife’s manic behavior on a train and never came back. Crumb’s DID forms a 24-identity horde called The Beast. The Beast has divided the people into the pure, individuals who can be seen as outcast or weird like him, and the impure, a normal person. Glass is the third sequel which ties Unbreakable and Split together. All three ‘superhumans’ are taken to a mental institution where a doctor from a secret society tries to convince them they are delusional and are trying to make up for past traumas. Of course, that proves to not be the case when we discover Mr. Glass, who is supposed to be sedated is not, planned for them all to be gathered there. Mr. Glass has a theory that comic books are historical documentation of past superhumans. So he makes a plan to reveal them to the world with proof by using Dunn and Crumb against each other. His plan sets off a sort of self-awareness in Dunn. It’s a long wait for Crumb to develop all 24 personalities but he is well awarded when they fight outside the mental institution in front of the outside security cameras. Although Mr. Glass dies, it was a suicide mission; his goal was to record them and post it for everyone to see, which they all do. 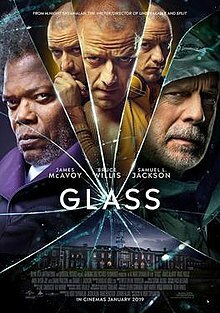 Glass is a good movie with a surprising reveal of events and secrets that lead up to the end and is good to watch in between Marvel and DC movie releases. It is also a fresh new way of looking at the way heroes are created instead as opposed to the usual chemical accident or stranger from another planet.